Find out who will win today’s match? 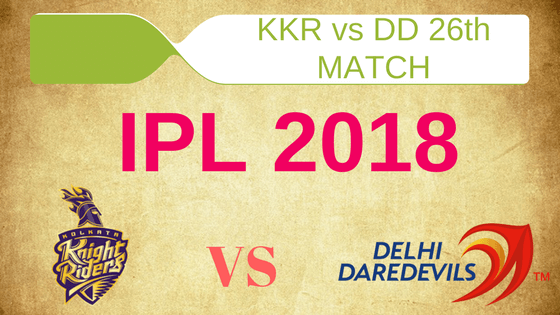 In Today’s Dream11 Fantasy Cricket Prediction of KKR vs DD 26th T20 Match IPL 2018 we will cover probable playing 11, dream11 best team, pitch report of Feroz Shah Kotla, Delhi, what astrology has to say on the toss. We will also cover players recent and past performance, weather report of Delhi, all the latest news and updates related to today’s match, dream11 guru prediction, the best choice for captain and vice-captain, key players, where to watch live cricket match of DD vs KKR and details of live streaming. All the details we provide are absolutely FREE. Make sure to read the complete post to get 100% benefit. Our strategy is very simple that may make you a winner of the grand league in any fantasy leagues. Crix11 predicts, players perform and we mean our reader wins. Let’s jump into the match details. Where Can You Watch the Live Streaming of KKR vs DD or Channels to Watch? Who Will Win the 26th Match of IPL 2018 Between DD vs KKR and Toss Prediction? What is the best combination of players for Dream11 26th Match? Date: The match will be played on 27th April 2018 (Friday). Match: Indian Premier League, DD vs KKR, IPL 2018. Venue: Delhi, Feroz Shah Kotla. Time: 02:30 AM GMT, 08:00 PM IST. The pitch of Feroz Shah Kotla is extremely slow. In the last game, the batsmen found it very difficult to play shots and the bowlers enjoyed bowling on this ground. Today also the pitch will be slow and it will favour the slow bowlers. It will be a low scoring game with full of drama. The average first inning score of this ground is 157. Highest total on this ground is 202/3 in 20 overs by IND v NZ. Lowest total on this ground is 120/10 in 19.3 overs by SL v SA. Today the weather in Delhi will be clear in the morning and it will be a sunny day but in afternoon it is expected to be partly cloudy. The sky will be clear before the match and there is no sign of rain. The temperature is expected to be 36-Degree Celsius and the humidity to be 28% which may go up to 35%. In last 5 matches, Delhi Daredevils has defeated Kolkata Knight Riders once. If we look at overall encounters, DD has won 7 times and KKR has won 13 times. At Feroz Shah, Kotla KKR is way ahead of DD. KKr has won 7 matches out of 8 matches. It will be interesting to see how a new captain of Delhi Daredevils leads their team. Star Sports has paid a huge amount of INR 16,347.50 Crores to get exclusive rights of IPL 2018 for live coverage for five years starting from 2018 to 2022. Star Sports has all the media rights including TV and all Digital Rights. You can watch the full match of Delhi Daredevils vs Kolkata Knight Riders on Star Sports. Rishabh Pant (wk), Glenn Maxwell, Shreyas Iyer (c), Daniel Christian, Chris Morris, Prithvi Shaw, Liam Plunkett, Naman Ojha, Gautam Gambhir, Trent Boult, Sandeep Lamichhane, Rahul Tewatia, Shahbaz Nadeem, Jayant Yadav, Amit Mishra, Colin Munro, Sayan Ghosh, Avesh Khan, Harshal Patel, Jason Roy, Gurkeerat Singh Mann, Mohammed Shami, Manjot Kalra, Vijay Shankar, Abhishek Sharma. Chris Lynn, Robin Uthappa, Dinesh Karthik (c & wk), Shubman Gill, Mitchell Johnson, Sunil Narine, Tom Curran, Vinay Kumar, Nitish Rana, Shivam Mavi, Cameron Delport, Andre Russell, Ishank Jaggi, Rinku Singh, Piyush Chawla, Apoorv Wankhade, Prasidh Krishna, Kuldeep Yadav, Javon Searles. Played 6 and won 1. This is what DD has achieved so far in this IPL. Gautam Gambhir stepped down from the captaincy and the leadership is handover to Shreyas Iyer. On the other hand, KKR played 6, won 3 and lost 3. Kolkata Knight Ridersares on top four positions in the points table. It will be interesting to see how Iyer leads the team. KKR should go with the same playing 11. In the previous game, Andre Russell had some injury and had to leave the field. If he is 100% fit then he will play as a pure batsman. KKR will not change the team until and unless there is a fitness issue. Sunil Narine, Nitish Rana, Andre Russell, Tom Curran, Shivam Mavi, Chris Lynn, Kuldeep Yadav, Dinesh Karthik (wk), Robin Uthappa, Piyush Chawla, Shubman Gill. Jason Roy hasn’t played the last game due to a side strain and Chris Morris had to sit because of a back injury. Nothing went right so far for DD in this IPL and they are struggling. Jason Roy may be seen in the playing 11 in today’s match. Prithvi Shaw has shown his skills in the last game and he will retain his place. Gautam Gambhir may be dropped. Colin Munro/Jason Roy/Daniel Christain, Shreyas Iyer (c), Prithvi Shaw, Trent Boult, Glenn Maxwell, Rahul Tewatia, Amit Mishra/ Shahbaz Nadeem, Rishabh Pant (wk), Avesh Khan, Liam Plunkett, Vijay Shankar/Gautam Gambhir. We have divided the key players in three section i,e wicket keepers, batsman, all-rounders, and bowlers. All the players selected in this section are on the basis of their recent performance. You can make your perfect team for dream11 from the list. Dinesh Karthik: In last 6 matches Karthik has scored 194 runs. He scored 43 runs in the last inning and contributed 26.5 points. 35.97% of the users have selected him in their dream11 fantasy teams. Rishabh Pant: In last 6 matches Rishabh Pant has scored 227 runs. He scored 4 runs in the last inning and contributed 8 points. 63.39% of the users have selected him in their teams. Pro tips: Both the players are good. You can keep anyone in your team. Make a combination of the above players for multiple teams. Chris Lynn: Lynn has scored 181 runs so far in this IPL. He scored 74 runs in the previous game and contributed 50 points. 77.5% of the users have chosen him in their dream teams. Robin Uthappa: Robin Uthappa plays with a straight bat and can score big in slow pitches like Delhi. He has scored 162 runs in last 6 innings. He has scored 34 runs in the last match and contributed 22.5 points. 81.88% of the users have taken him in their teams. Nitish Rana: Nitish Rana scored 165 runs and took 4 wickets so far in this season. He contributed 3.5 points in the last inning. 85.53% of the users have taken him in their teams. Shreyas Iyer: Shreyas will play his first match as captain and he has point to prove. In last 6 games, he has scored 151 runs. He has scored 57 runs in the last game and contributed 46 points. 84.7% of the users have taken him in their teams. Prithvi Shaw: Prithvi Shaw has shown his calibre in the last game. He could be a dangerous player. He scored 22 runs and contributed 15.5 points in the last match. 17.73% of the users have selected him in their dream 11 teams. Jason Roy: Jason Roy had to sit in the last game due to injury but he may return to playing 11 for today’s match. So far he has scored 97 runs last three games. 63.09% of the users have selected him in their teams. Pro tips: You can Keep Gautam Gambhir in your team for a grand league as only 25.99% of the users has taken him. Make a combination of the above players for multiple teams. Sunil Narine: Narine is a kind of player who can give points with the bat and ball both. Till now he has scored 108 runs and took 8 wickets. He has contributed 12.5 points in the last game. 88.11% of the dream11 fantasy users have selected him in their teams. Glenn Maxwell: So far in this IPL 2018, Maxell failed to score big but he is a dangerous player. So far he has contributed 85 points. 58.09% of the users have taken him in their teams. Pro tips: Make a combination of the above players for multiple teams. Maxwell has a strike rate of 151.4 against the spinners, so he may bat early in the innings. Trent Boult: 76.28% of the dream11 users has selected him in their teams. He took 9 wickets so far in this season of IPL. he took 2 wickets in the last innings and contributed 22 points. Kuldeep Yadav: Kuldeep Yadav took six wickets in last 6 matches and contributed 82 points so far. 60.19% of the users have selected him in their teams for today’s match. Piyush Chawla: Piyush Chawla took 5 wickets in previous 6 games and contributed 64 points. 25.43% of the users have taken him in their teams. Liam Plunkett: What a debut Plunkett had in IPL 2018? He took 3 wickets and contributed 38 points. 53.95% of the users have selected him. Rahul Tewatia: Tewatia has scored 47 runs in the last couple of innings and took 6 wickets. He scored 24 runs in the previous inning and contributed 19.5 points. 54.65% of the users have selected him in their teams. Shivam Mavi: He is one of the best bowlers from U-19 and can be a valuable player. 15.75% of the users have selected him in their teams. Pro tips: As the pitch may support the bowlers in today’s match, so make a combination of the above players. Pro tips: The above players are most likely to perform. You can take them as a captain and vice-captain. You can keep captain from key players. Pro tips: You can take the above players as a captain and vice-captain. Kolkata Knight Riders seem to be a strong team on paper and their previous records on this venue are very good. According to our cricket experts, KKR will win the match but our astrology team says DD will win today’s match. The team winning the toss should bat first and defend the target as the pitch is slow and defending a good total will be a smart choice. According to our astrology prediction, KKR will win the toss and they will invite DD to bat first. Note: To win every match play small leagues. Note: The Demo teams will be updated before the deadline. Subscribe to our notification to get full updates. The pitch is expected to be a slow one but Delhi Daredevils lost the last game the curators may change the pitch, so stick with reliable and safe players. You can make a team for grand league taking risky players. Conclusion: This is it for Today’s Dream11 Fantasy Cricket Match Prediction of KKR vs DD, 26th T20 Match, IPL 2018 which will be played on Friday 27th April. You can give your valuable feedback in the comment section. Subscribe to our notification of latest updates. GOODBYE!